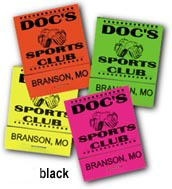 Excellent Advertising for restaurants, bars, clubs, bail bondsmen, or organizations with custom printed matches and matchbooks. 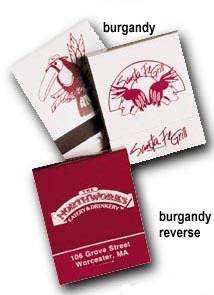 We offer many types of printed matchbooks and box matches from standard economy priced to premium 4-color and metallic foil quality at wholesale prices. Custom printed with your logo, address, phone number, or whatever you require! Many colors and designs to choose from. One of the the most cost-effective advertising medium ever invented! There is no equal in low cost advertising as these book of matches. Give us a call (706-374-0710) for a FREE quote and to put our years of promotional and advertising experience to work for you. Specifications: There will be an additional $50 non-refundable artwork layout charge must be paid before work can begin. 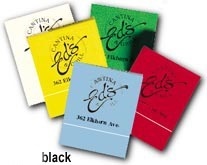 Stock Colors only are available on White Match Books: black, blue, green, red and purple. 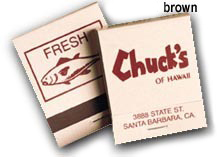 Minimum order is one case, or 2500 books and are packed in cases of 2500 matchbooks.